She knew fate had turned against her when she opened the cookie and read: "In love, the rats are the first to jump a sinking ship." Rosalyn had never met a fortune cookie that could be trusted. The raven-haired stable owner pursed her lips and shook her head. For her, love was just a bag of bitter lemons. Boyfriend number five had exited stage left two days ago after he hit her new horse, Excalibur, in the face and broke his hand. "Let us pray that while eating those lemons he doesn't choke, fall down, and break his other hand," she said to the walls. It was a slow day at the stable. Mondays were like that. The clients did, after all, have to work for a living. Most of them anyway. Perhaps just a week after Thanksgiving, they were all out Christmas shopping. For her, there would be no thoughts of Christmas until the November accounting was done. Rosalyn’s home office overlooked a small pasture and the road beyond. At the moment, Rosalyn faced desk work, a drooling Yellow Lab named Buck, and an order of General Tsao’s Chicken, heavy on the grease. She pushed the box of food aside. Chinese takeout in Colorado could be a bit of a gamble. Buck whined and reached out with his paw. Rosalyn pushed it aside. “Hush, I have to think,” she said. She needed to complete the details on the intake forms for Ace, the new horse, just shipped in from Texas on the Nationwide Horse Transportation van, so she could invoice her new client. Ace’s owner planned to arrive later. Rosalyn crossed her fingers and looked up to the ceiling. For once, could we please have a low-maintenance boarder? Wait, let me guess. There is no such thing. She sighed. Movement outside on the tree-lined road caught Rosalyn’s eye. A man with dark, slightly graying hair that hung down to his waste in dreadlocks strode along the road in ragged clothes. The hobo -- did they even have those anymore? -- gestured to everyone and nobody, she could not tell for sure. Excalibur stood in the front pasture watching the man. 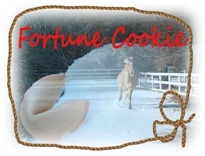 When the palomino gelding heard Rosalyn’s office window open, the horse turned to look at her. It was as if the animal’s hazel eyes – unusual for a horse – stared right through her. Rosalyn got up and opened her window just in time to hear the man shout, "The time will come! The time will come!" She chewed her lower lip. This man had been a fixture in the neighborhood for several years. His home remained a mystery, probably a sleeping bag in a cardboard box somewhere along the nearby river. The man passed directly in front of her pasture. Excalibur snorted and trotted away. Rosalyn shivered and closed the window. So far, the golden horse, rescued from the auction yard, refused to do anything but panic near humans. Rosalyn sighed again, massaged her temples, and ran her fingers through her mane of hair. She grabbed another fortune cookie, broke it open, and read: "Business and health matters will improve."